The Beale Treasure - Is It A Hoax? The Beale Treasure is another one of those lost treasure stories that involves a ciphered message. But before I explain the details behind the secret codes, I will give you a background on the treasure. Thomas Jefferson Beale supposedly came upon this treasure in 1818. However, there are no records anywhere of Beale’s existence. 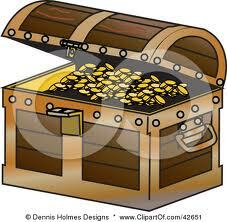 The treasure, consisting of gold, silver and jewels has been estimated to be worth today upwards of 50 million dollars. It was apparently found by Beale and a team of twenty-nine other individuals, north of Santa Fe, New Mexico. In addition, the Beale treasure was apparently found by accident. Here is a brief explanation of how. Beale and his group of twenty-nine individuals were on their way west to hunt buffalo. They were in the area of Santa Fe when they stopped to camp. Here is an excerpt from a note that was found inside an iron box, that Beale gave to Robert Morriss of Lynchburg Virginia after he located the treasure. Robert also becomes a critical figure in the Beale treasure. The note explained that Beale and his men worked the site for the next 1 ½ years. During that time they accumulated a large quantity of gold, and silver. The silver was mined close to the area where they had found the gold. Eventually, the men decided that the best thing to do with the treasure was to take it back to Virginia, where they were from, and hide it for safekeeping. However, because of the weight, which would make traveling difficult, the men decided to trade some of the gold and silver for jewels. It was 1820 when Beale headed to Lynchburg, Virginia, and buried the treasure. The Beale treasure is supposedly buried near Montvale in Virginia. Robert Morriss was a Lynchburg innkeeper. It was in 1820 when Beale met, and entrusted Morriss with the locked, iron box. However, it wasn’t until twenty-three years later, that Morriss opened the box. Many years had gone by since the time that Beale gave Morriss the iron box. Beale had left Virginia many years earlier, no one knowing where he went. Morriss assumed Beale was now dead, and with his curiosity peaked, he decided to open the box. It was then that he found the note. Also in the iron box were the three ciphers. The Beale ciphers consist of separate ciphertexts. There are three of these ciphertexts. One of the ciphertexts explains where the treasure is today, and the other two ciphertexts explain what the contents of the treasure are. Robert Morriss felt a responsibility to the family of what he now thought were dead miners. He wanted to find the treasure, and then pass it on to them. However, he could not understand the coded messages. For the next twenty years Morriss tried to understand the messages. Then, in 1862 when he was 84 years old, Morriss decided it was time to share what he had with another. He gave the ciphers to a friend. Unfortunately no record was made of who the friend was. But from that friend came two important happenings. The friend printed a pamphlet which contained Beale’s story, and information regarding the ciphers. Next, the unknown friend of Beale supposedly deciphered one of the coded papers. Interestingly, the coded texts were apparently tied by numbers to the words of the Declaration of Independence. Below is the message derived from the codes. The ciphered message also indicated the amount of the treasure. When the anonymous individual discovered it’s worth, he spent much of his time trying to decipher the other two codes. Unfortunately, by 1885, the unknown individual had enough of trying to figure out where the treasure was buried, and decided to make public his story, but still wanting to remain unknown. Who was Thomas Jefferson Beale? Did he really exist? Is this treasure story just a finely tuned figment of someone’s imagination? All of these questions regarding the Beale treasure cannot be answered until the real Thomas Jefferson Beale is authenticated. You may not find the Beale treasure in a ghost town. However, you never know what you will find. If your going to search for buried treasure, know the law.